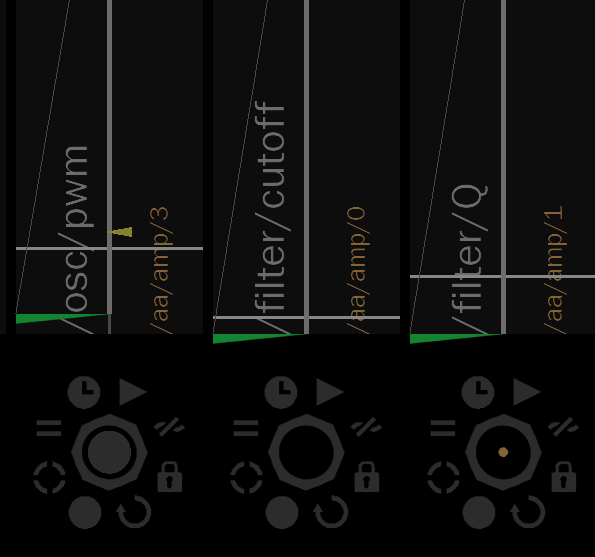 The OSC and MIDI controller Parat+ for iOS features a series of tools which enable sophisticated interactive controls. 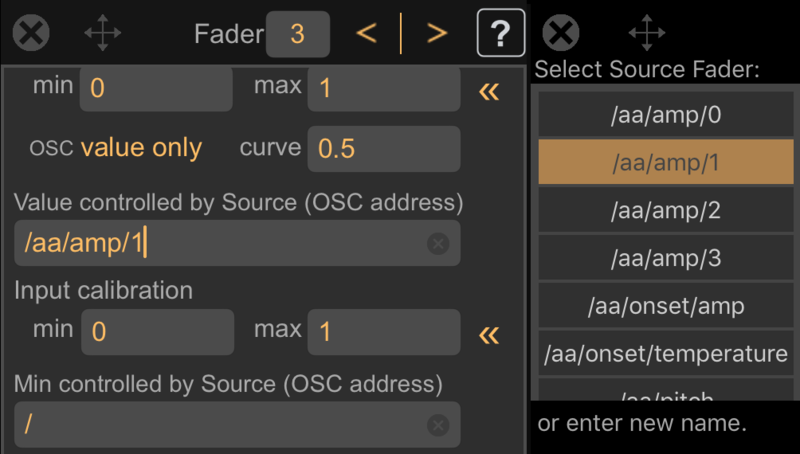 Parat+ can become a central hub to design interactive connections between Audio Analysis and/or external OSC streams (available as Source Faders) and the Parat+ Faders to control software parameters. Parat+ Source Faders enable remote controlled and automated Faders. By default Parat+ offers four envelop followers (amplitude analysis of microphon) with various decay times (/aa/amp/0, /aa/amp/1, /aa/amp/2, /aa/amp/3). Furthermore the iOS device’s tilt information is available (/quaternion/x, /quaternion/y, /quaternion/z). Open the Edit Fader view of the Fader you want to connect. Scroll down to the text field ‘Value controlled by Source (OSC address). When tapping into this field the keyboard will show as well as a list of currently available Source Faders. Start typing any part of the OSC address of the Source and the selection will reduce to those Sources containing what you are writing, and/or scroll and select from the Source list. This example shows the Source /aa/amp/1 which is one of four Sources based on the amplitude analysis of the audio input (microphone by default) of the iOS device. All Faders controlled by Source Faders show the respoctive Source OSC address. N.B. Control of the Fader by Touch and Looped or One-shot playback will always take precedence over the Source, as well as the option to lock the Fader. Each Source can be routed to any number of Faders. 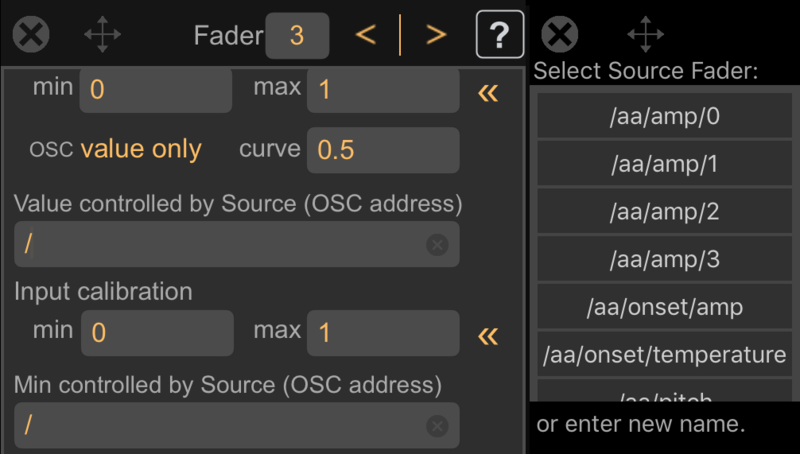 The Fader Calibrator can be used on each Fader to amplify the Source values (by reducing the maximum handle) and create a minimum threshold (by increasing the minimum handle). These values can also be set in the Edit Fader view.